Italian football manager and former forward footballer, Gianluca Vialli, was born on July 9,1964. Vialli kicked off his career in 1980 with Cremonese where he made 2 goals in 105 appearances. He also represented his nation twice at the FIFA World Cups. Vialli is married to Cathryn White Cooper since 2003, they have 2 children. Vialli also published a book, The Italian Job: A Journey to the Heart of Two Great Footballing cultures, which describes his experience with the different cultures in English and in Italian football. He also works as a football commentator at Sky Italia. He known for his energetic and strong character on field. He was very creative with his style of playing. Vialli officially started his career with Cremonese in Serie C1, he was soon promoted to Serie B and after the 1983-84 season, where he scored ten goals, he was transferred to Sampdoria. At the new club he formed a healthy partnership with his team mate and childhood friend Roberto Mancini. They got the nickname “The Goal Twins.” With the help of Vialli, Sampdoria won their first Serie A championship in the 1990-91 season, Vialli also became the top scorer in this season with 19 goals. He also helped the club win a UEFA Cup Winners’ Cup in 1990 after netting both the goals in the final against Anderlecht, again being named the top scorer of the tournament. He also helped the team win the Italian Cups thrice in the years: 1985, 1988, 1989. Sampdoria also won the Supercoppa Italiana and in 1992 reached the final of European Cup but lost to FC Barcelona by 1-0. After the European Cup in ’92, Vialli went to Juventus at a record fee of £12.5million. Vialli showed true talent with Juventus as he helped them win the UEFA Cup in his first season. He also won the Scudetto and Italian Cup in 1995 with the new club but Juventus couldn’t complete a treble due to the defeat in the 1995 UEFA Cup against Parma. He captained the team to a Suppercoppa Italiana and a Champions League win in 1996. Vialli made an accumulated 102 appearances and scored 38 goals with Juventus. 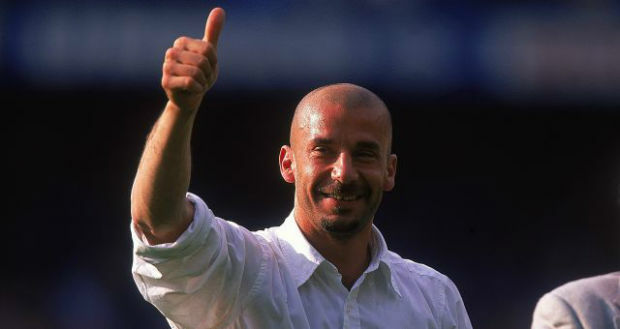 In the summer of 1996, Vialli went to Chelsea on a free transfer. During Vialli’s first season with Chelsea, they won the FA Cup. During the 1997-98 FA premier league season, Vialli scored four goals and during the same season in the UEFA Cup Winners’ Cup, he scored a hat trick. After the discharge of the prior Chelsea manager, Ruud Gullit, Vialli took the role of player-manager and won the 1998 UEFA Cup Winners’ Cup and the Football League Cup. He also succeeded in beating Real Madrid in the 1998 UEFA Super Cup final. By the 1998-99 season, Vialli assumed retirement from his playing days to focus more on his managerial career. Vialli made his last appearance in the 1998-99 Premier League against Derby County where he scored the winning goal. After winning the 1998 UEFA Cup Winners’ Cup, Vialli became the youngest manager to win a UEFA tournament at the age of 33. The record stood for 13 years. With Vialli as manager, Chelsea reached the quarter finals of the champions league in 1999-2000 but lost the second leg against FC Barcelona. In the 2000-01 season, Chelsea beat Manchester United and won the FA Charity Shield, he became one of Chelsea’s most successful managers. He was sacked later in the season. Vialli became the manager of Watford but after a disappointing season he was sacked a year later. Vialli made an appearance with the Italy Under 21 team 20 times and scored 11 goals. Vialli first appeared with the Italy senior team in a friendly match against Poland. Vialli was included in the FIFA World Cup team in 1986. During the 1990 FIFA World Cup, Vialli wasn’t as his optimal performance, he missed goals and penalties. He made his last appearance with the team in 1992. He made a total of 59 appearances and scored 16 goals.